I heart finding the mini shells! 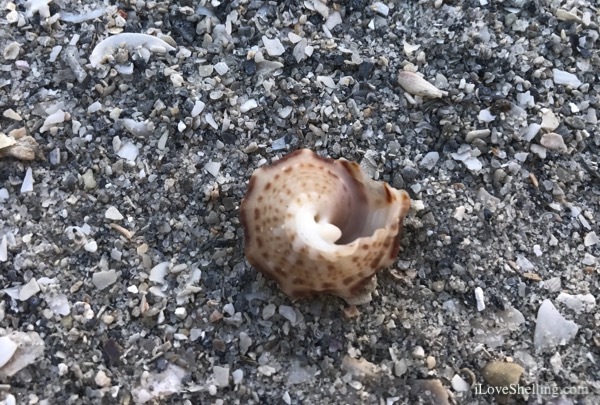 I’ve been enjoying short little walks (mostly at Gulfside City Park) on the beach this week to strengthen my sprained ankle so searching for miniature seashells is abshellutely perfect exercise. 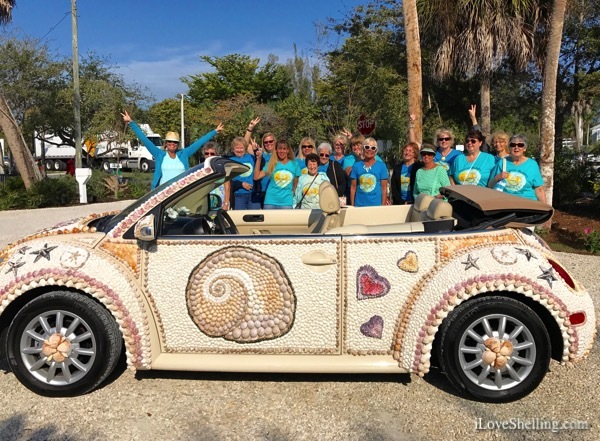 Since I’ve had my bum ankle, it’s been the perfect time to run around in Shell Love Bug! 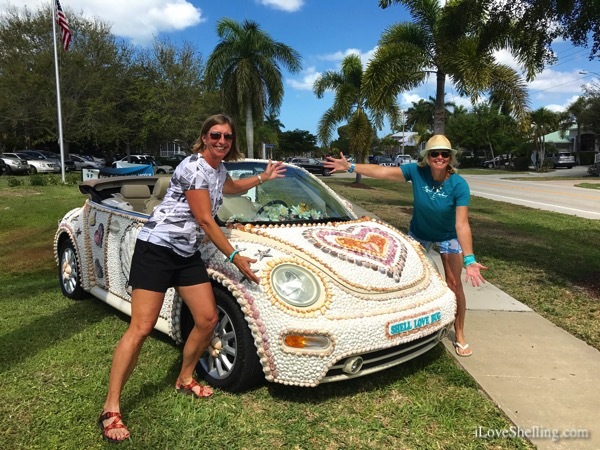 My good friend Diane and I took it to the Marco Island Shell Show. The Marco Shell Club is awesome! I met big time shellers Jack and Ella (Marco, FL) a few weeks earlier at the Sanibel Shell Festival then I got to see them again at the Marco Shell Show too. It was so much fun to see them again…. 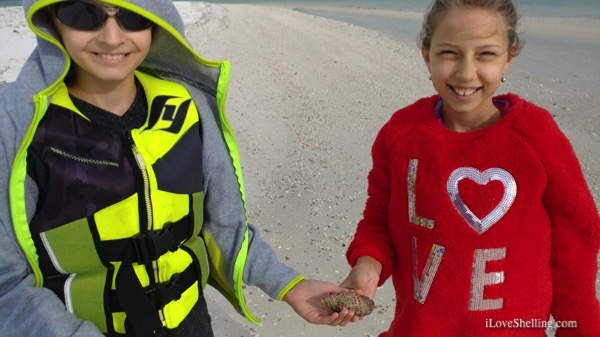 then omigosh… the next day they found a JUNONIA! It was completely covered in barnacles but they knew right away what they had. They cleaned it up to uncover this stunning specimen. Boom Shellalaka! Way to go! 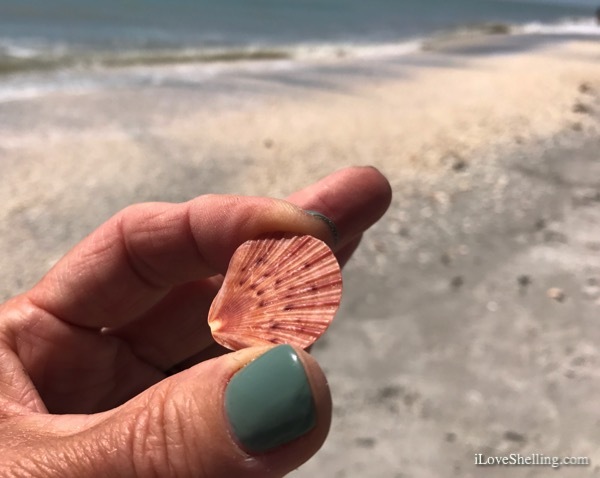 Michelle (Fort Myers) showed me this little shell she found. Hmmmm… it sorta looks like a BUTTON SHELL. Here’s the aperture. Can anybody out there identify it? MurexKen? SusanH? Y’all think its a WEDDING SHELL? So it’s been a fun week shellavanting around on the beach and with the bug. Maybe just as much fun as these MILLIPEDE SEA STARS were having while doing their Locust yoga poses. PS- I know my pages here on my blog are a little messed up if you are looking at my posts on a mobile device or tablet. My Seashells Identification button, Beach Bling Identification button disappeared- Ugh! I’m trying to fix all that so please bear with me? 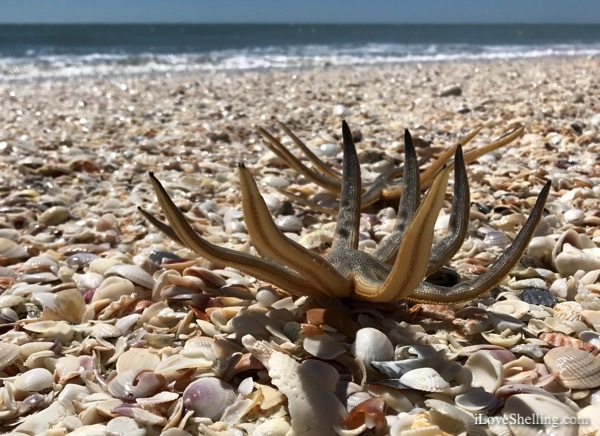 So just in case you were looking for the pages to identify your seashells or beach bling…. Your pen-shell heart photo is really superb! I would say your button shell is just a button shell, but by Sanibel standards it is unusual in its sculpture. 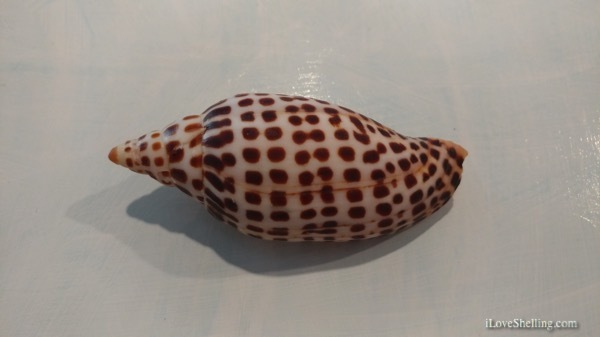 However, in the Caribbean button shells, that shape is very common indeed, as you say, and believe it or not, the Caribbean species and the Florida species are considered to be the same species, even though they are different in size and in typical appearance. The one you just found — was it as big as they usually are, or was it smaller? I think the shell is Star Arene, Arene cruentata, SE FL to the WI. Gem Arene, Arene tricarinata. NC to the WI. I love your posts! Read and reread them. Leaving for Turks and Caicos tomorrow to shell. Saw your 2013 post on your trip. I can’t wait to find my little gift from the sea. Thanks for your inspiration. Hi Linda, thanks for the input! I should have taken a few other photos with the side position in view to compare. I’m hoping Michelle will check them out and compare the real shell with some of the photos in your IDs. Thanks again- I’ll keep ya posted. Omigosh Nancy have a wonderful time!!! When ya get back, Let me know how your trip was?! I agree, I wat that pen she’ll photo! 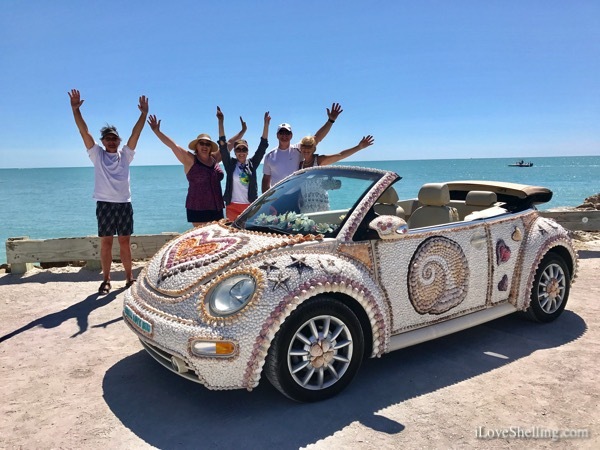 Hi Pam, so very glad to see that your ankle is on the mend and that you are able to be out and about on the beach and with the fabulous Shell Love Bug. I absolutely LOVE LOVE LOVE your pen shell photo! Looking forward to your June Schedules, we want to plan a trip when you have settled on dates in June or July. love your heart pin shell pic, pam!! such a clever idea, so cute!! Wonderful blog! 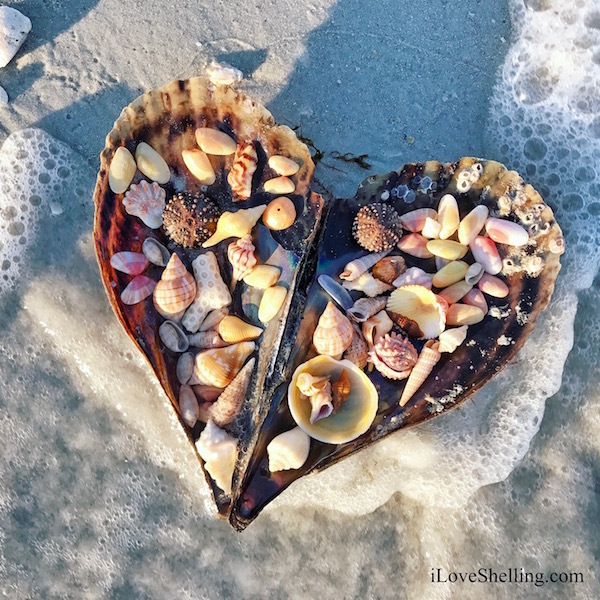 Thank you for sharing especially for those of us who are passionate about seashells! Wondering if you could make suggestion or advise how to clean my JUNONIA! I washed in water/blue dawn bath with a capful of bleach. Had rust stains, dirt and cloudy film only; no barnacles. I was told by a local that quick dip in water muratic acid dip is only way to get rid of the calcium build up and achieve color and shine. Others tell me never acid for Junonia but did not offer alternatives. I cried, dipped in mineral oil and polished. Close, but still foggy. Help?